Sergeant Bruce Crowley, A section 4RMT of the NZ Army Service Corps, was the first New Zealand POW to make a successful escape from Germany back to Britain in World War II. Captured during the Allied withdrawal from Greece in April 1941, en route to a German POW camp he jumped from the train and for several months lived among Greek villagers. Re-captured he was sent to the infamous Stalag VIIIB in southeastern Europe. In July 1943 Crowley scaled a wall and escaped from a working party at Breslau. Disguised as a civilian he made his way by train to a Baltic port where he planned to stowaway on a ship to Sweden. Read about Bruce Crowley’s remarkable escapades on the run from the Germans in this new book recorded by the old soldier himself. 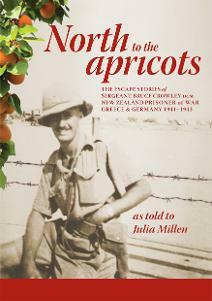 Another Kiwi First from Radio New Zealand's Summer Nights on Monday 14 January 2013 The daring escapes of Sergeant Bruce Crowley DCM, prisoner of war in Greece and Germany, 1941-1943, as described in the recently released tale North to the Apricots with writer Julia Millen. "I have just read your book "North to the Apricots"... and I had to contact you to say how much I enjoyed it. My father was taken prisoner in Greece. He always talked about what a hell hole Salonika was, but that's all. Your story answered many questions. He never talked about the cold, but certainly the lack of food. He ended up at Stalag 18a in Austria. This year we are visiting the farm that dad worked on for 18 months. The family are looking forward to our visit. The records are still in existence detailing where our soldiers worked. Thank you again for your book, it was very, very good... Many thanks.